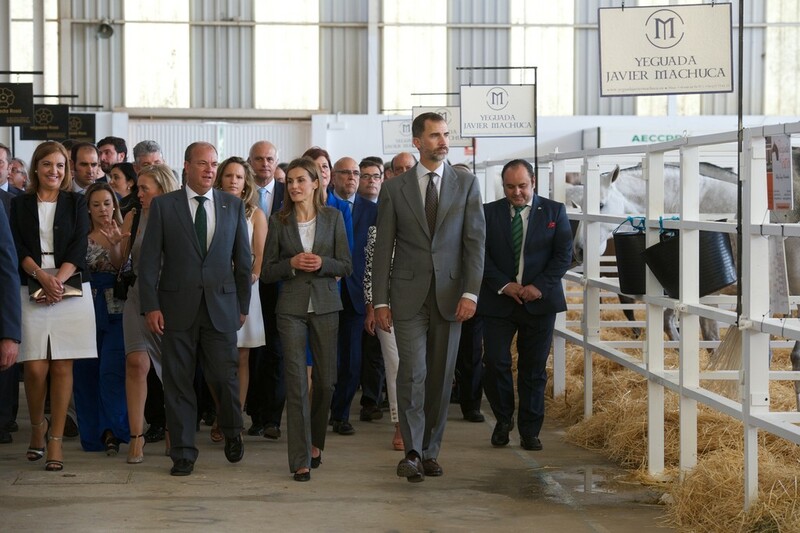 Today, Queen Letizia joined her husband King Felipe to officially open the 2014 ﻿International Livestock Show﻿ in Zafra, Spain. The annual fair is one of the most important events for Spanish farmers which offers them an opportunity to showcase their produce to the world. Before touring the show grounds, their Majesties greeted the waiting public. During the opening ceremony, which was held in the auditorium of the Central Pavilion of the Exhibition Centre, their Majesties unveiled a plaque and King Felipe made a speech where he acknowledged the contribution of farmers and said that the "Spanish food sector as a whole has proved to be one of the great engines of the Spanish economic recovery." The royal couple wore grey city-slicker suits to the country fair. They may have looked out of place amongst the farm animals in their business attire but they were dressed appropriately for promoting the commerce of Spanish agriculture and farming. Queen Letizia kept her outfit colours simple, pairing her grey wool Hugo Boss pant suit with a white voile blouse. Her Majesty is wearing the grey Hugo Boss BOSS 'Jaelly' suit jacket and matching trousers. rope bow atop a round toe, and a 3cm covered heel. The Queen added a touch of bling to her outfit, wearing her Chanel 'Comete' diamond star stud earrings.